G A Groves was appointed captain, Newtown Artillery, at Newtown, Frederick County, Virginia, on 19 April, 1861, and was on recruiting duty on 11 July, 1861. First Lieutenant R F Beckham, corps engineers, Provisional Army of Virginia, was ordered to Harpers Ferry, Jefferson County, Virginia, by Special Orders No.36, Paragraph I, Headquarters, Virginia Forces, Richmond, Henrico County, Virginia, on 9 May, 1861, and was assigned to command the Newtown Artillery at Winchester, Frederick County, Virginia, on 11 July, 1861. J A Marks was appointed first lieutenant, Newtown Artillery, at Newtown, Frederick County, Virginia, on 19 April, 1861. S T Wright was appointed second lieutenant, Newtown Artillery, at Harpers Ferry, Jefferson County, Virginia, on 19 April, 1861. "There are from Winchester four volunteer companies in the service - a troop of horse and an Artillery company, from Newtown, eight miles from Winchester, with another company organized of seventy stalwart mountain boys, now drilling for immediate service, under the command of F. W. M. Holliday, Common wealth's Attorney, a gentleman who was the secession candidate for a seat in the Convention, and, strange to say, to a man they all voted against him, with one or two exceptions, and two weeks ago marched into town (after having previously volunteered at their mountain home,) and elected him as their Captain, because he told them the truth during the Convention canvass." "Capt. Freeman's company of artillery from Culpeper county, was below the minimum, (fifty men rank and file,) and was consequently disbanded. The arms and equipment were handed over to the Newtown company from Frederick." "The Artillery fought this battle as did many others, after a wearisome journey from Winchester, and with but two or three hours sleep since the Wednesday night proceedeing, having arrived at the Junction about midnight on Saturday night." "In order to assist in the training of the company, First Lieutenant Robert F. Beckham, a West Point graduate and proven officer, had been assigned to the unit. He would take charge in Captain Montgomery's absence." The Newtown Artillery was accepted in state service at Newtown, Frederick County, Virgina, on 19 April, 1861, and was stationed at Harpers Ferry, Jefferson County, Virginia, on 27 April, 1861. Mustered for one year, Harpers Ferry, Jefferson County, Virginia, 3 May, 1861: The Newtown Artillery was mustered in state service for one year as the 1st Virginia Light Artillery, Company C, at Harpers Ferry, Jefferson County, Virginia, by Captain J D Imboden, Staunton Artillery, on 3 May, 1861 (See the Staunton Artillery). Note: The 1st Virginia Light Artillery was not recognised by the Adjutant & Inspector General's Office, Richmond, Henrico County, Virginia, and was disbanded prior to 26 April, 1862 (See the 1st Rockbridge Artillery). Harpers Ferry, Jefferson County, to Winchester, Frederick County, Virginia, 29 May, 1861: The Newtown Artillery was stationed at Winchester, Frederick County, Virginia, on 29 May, 1861. Note: The Letcher Artillery, under the command of Captain R Freeman, was stationed at Culpeper Courthouse, Culpeper County, Virginia, on 17 April, 1861, and was ordered to proceed by the Orange & Alexandria Railroad to Harpers Ferry, Jefferson County, Virginia, in the morning on 18 April, 1861. The company was below the minimum strength (50), and was disbanded and the arms and equipment assigned to the Newtown Artillery at Harpers Ferry, Jefferson County, Virginia, on 6 June, 1861 (See the 13th Virginia Infantry). General Orders No.25, Headquarters, Virginia Forces, Richmond, Henrico County, Virginia, 8 June, 1861: The Newtown Artillery was assigned to the Confederate States by General Orders No.25, Headquarters, Virginia Forces, Richmond, Henrico County, Virginia, on 8 June, 1861, and was accepted in Confederate service on 1 July, 1861. Evacuation Harpers Ferry, Jefferson County, Virginia, 15 June 1861: The Newtown Artillery evacuated Harpers Ferry, Jefferson County, Virginia, in the morning on 15 June, 1861, and was ordered to proceed by the Smithfield, Charlestown & Harpers Ferry Turnpike to Winchester, Frederick County, Virginia, the same day. The regiment arrived at Charlestown, Jefferson County, Virginia, in the afternoon on 15 June, 1861. Note: The Newtown Artillery was stationed at Camp Johnston, on the Berryville & Charleston Turnpike, on the North or South Fork of Bull Skin Run, three or four miles west of Charlestown, Jefferson County, Virginia, in the evening on 15 June, 1861. Camp Johnston, on the Berryville & Charleston Turnpike, on the North or South Fork of Bull Skin Run, three or four miles west of Charlestown, Jefferson County, to Mill Creek, a quarter of a mile north of Bunker Hill, Berkeley County, Virginia, 16 June, 1861: The Newtown Artillery was ordered to Bunker Hill, Berkeley County, Virginia, at 9 AM on 16 June, 1861, and arrived at Mill Creek, a quarter of a mile north of Bunker Hill, via Smithfield or Middleway, Berkeley County, Virginia, in the evening the same day. Mill Creek, a quarter of a mile north of Bunker Hill, Berkeley County, to Stephenson's Station, on the Winchester & Potomac Railroad, four miles northeast of Frederick County, Virginia, 17 June, 1861: The Newtown Artillery was ordered to proceed by the Martinsburg Turnpike to Winchester, Frederick County, Virginia, at 2 PM on 17 June, 1861, and arrived at Camp Defiance, Stephenson's Station, on the Winchester & Potomac Railroad, four miles northeast of Winchester, Frederick County, Virginia, in the evening the same day. Stephenson's Station, on the Winchester & Potomac Railroad, four miles northeast of Winchester, to Hollingsworth Grove, east of the Millwood Turnpike, one mile southeast of Winchester, Frederick County, Virginia, 20 June, 1861: The Newtown Artillery was ordered to Winchester, Frederick County, Virginia, at 7 AM on 20 June, 1861, dated PM on 19 June, 1861, and arrived at Hollingsworth Grove, east of the Millwood Turnpike, one mile southeast of Winchester, Frederick County, Virginia, the same day. Note: First Lieutenant R F Beckham, artillery, Confederate States Army, was stationed at Winchester, Frederick County, Virginia, on 31 May and 23 June, 1861. Hollingsworth Grove, east of the Millwood Turnpike, one mile southeast of Winchester, to J M Mason's House or Selma, half a mile west of Winchester, Frederick County, Virginia, 24 June, 1861: The Newtown Artillery arrived at Camp Johnston, on the Northwestern Turnpike, in the vicinity of J M Mason's House or Selma, half a mile west of Winchester, Frederick County, Virginia, on 24 June, 1861. Note: The Newtown Artillery was assigned to the Fourth Brigade, Army of the Shenandoah, under the command of Colonel A Elzey, Jr., 1st Maryland Infantry, at Camp Johnston, in the vicinity of J M Mason's House or Selma, half a mile west of Winchester, Frederick County, Virginia, on 24 June, 1861 (See the 1st Maryland Infantry). Camp Johnston, on the Northwestern Turnpike, in the vicinity of J M Mason's House or Selma, half a mile west of Winchester, Frederick County, to Darkesville, Berkeley County, Virginia, 2-3 July, 1861: The Newtown Artillery was ordered to proceed by the Martinsburg Turnpike to Darkesville, Berkeley County, Virginia, on 2 July, 1861, and arrived via Bunker Hill, Berkeley County, Virginia, at 10 AM on 3 July, 1861. Darkesville, Berkeley County, to J M Mason's House or Selma, half a mile west of Winchester, Frederick County, Virginia, 7 July, 1861: The Newtown Artillery was ordered to Winchester, Frederick County, Virginia, in the morning on 7 July, 1861, and arrived at Camp Johnston, on the Northwestern Turnpike, in the vicinity of J M Mason's House or Selma, half a mile west of Winchester, Frederick County, Virginia, at 5 PM the same day. Note: Captain G A Groves, Newtown Artillery, was assigned to recruiting duty between (?) June and (?) 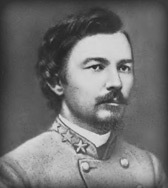 July, 1861, and First Lieutenant R F Beckham, artillery, Confederate States Army, was assigned to command the Newtown Artillery at Camp Johnston, on the Northwestern Turnpike, in the vicinity of J M Mason's House or Selma, half a mile west of Winchester, Frederick County, Virginia, on 11 July, 1861. The Newtown Artillery was ordered to Manassas Junction, Prince William County, Virginia, by Special Orders No.1, Headquarters, Army of the Shenandoah, Winchester, Frederick County, Virginia, at 1 AM on 18 July, 1861, dated 17 July, 1861. Camp Johnston, on the Northwestern Turnpike, in the vicinity of J M Mason's House or Selma, half a mile west of Winchester, Frederick County, to Piedmont Station, Fauquier County, Virginia, 18-19 July, 1861: The Newtown Artillery was ordered to proceed by the Millwood Turnpike to Piedmont Station, Fauquier County, Virginia, at 5 PM on 18 July, 1861, and arrived at Berry's Ferry, on the Shenandoah River, three and a half miles southeast of Millwood, Clarke County, Virginia, at 7 AM on 19 July, 1861. The company was ordered across the Shenandoah River, at Berry's Ferry, three and a half miles southeast of Millwood, Clarke County, Virginia, at 9 AM the same day and arrived at Piedmont Station via Ashby's Gap, Paris, and Upperville, Fauquier County, Virginia, at 10 PM on 19 July, 1861. Piedmont Station, Fauquier County, to Manassas Junction, Prince William County, Virginia, 18-20 July, 1861: The Newtown Artillery was ordered to proceed by road to Manassas Junction, Prince William County, Virginia, in the morning on the 20 July, 1861, and arrived at Camp Pickens, Manassas Junction, Prince William County, via Salem and White Plains, Fauquier County, Virginia, at 12 AM on 21 July, 1861. Note: Brigadier General E K Smith, Confederate States Army, assumed command of the Fourth Brigade, Army of the Shenandoah, at Piedmont Station, Fauquier County, Virginia, in the morning on 21 July, 1861 (See the Fifth Brigade, Army of the Shenandoah). After the first battle of Manassas the Newtown Artillery arrived at Camp Walker, on the Orange & Alexandria Railroad, one and a half miles southwest of McLean's Ford, on the Bull Run River, in the evening on 21 July, 1861. Camp Walker, on the Orange & Alexandria Railroad, one & a half miles southwest of McLean's Ford, on the Bull Run River, to Fairfax Station, Fairfax County, Virginia, 23 July, 1861: The Newtown Artillery was ordered to Fairfax Station, Fairfax County, Virginia, at 10 PM on 23 July, 1861, and was accompanied by 10th Virginia Infantry and 13th Virginia Infantry. The company arrived at Camp Blair, Fairfax Station, Fairfax County, Virginia, the same day. First Lieutenant R F Beckham, artillery, Confederate States Army: Brevet Second Lieutenant R F Beckham, United States Topographical Engineers, resigned on 3 May, 1861, and was appointed first lieutenant, artillery, Confederate States Army, on 5 July, 1861, dated 16 March, 1861. First Lieutenant R F Beckham, artillery, corps engineers, Provisional Army of Virginia, was assigned to the command the Newtown Artillery at Winchester, Frederick County, Virginia, on 11 July, 1861, and was assigned to the staff of Major General G W Smith, Confederate States Army, on 1 October, 1861. He was assigned to command the Jeff Davis Artillery by Special Orders No.423, Headquarters, First Corps, Army of the Potomac, Camp Pickens, Manassas Junction, Prince William County, Virginia, on 14 October, 1861. Disbanded at Winchester, Frederick County, Virginia, 4 October, 1862: The Newtown Artillery was disbanded and the men and horses assigned to the Stuart Horse Artillery, under the command of Captain J Pelham, at Winchester, Frederick County, Virginia, by Special Orders No.209, Adjutant & Inspector General's Office, Richmond, Henrico County, Virginia, on 4 October, 1862. Colonel A Elzey, Jr., 1st Maryland Infantry, Fourth Brigade, Army of the Shenandoah: Captain A Elzey, Jr., 2nd United States Artillery, Light Company E, resigned on 3 March, 1861, and was appointed major, artillery, Confederate States Army, on 18 May, 1861, dated 16 March, 1861 (See the 2nd United States Artillery, Light Company E). Major A Elzey, Jr., Confederate States Army, was assigned to mustering duty at Atlanta, Fulton County, Georgia, by Special Orders No.57, Paragraph IV, Adjutant & Inspectors General's Office, Montgomery, Montgomery County, Alabama, on 23 May, 1861, and was appointed colonel, 1st Maryland Infantry, at Richmond, Henrico County, Virginia, on 17 June, 1861. Colonel A Elzey, Jr., 1st Maryland Infantry, was assigned to command the Fourth Brigade, Army of the Shenandoah, at Winchester, on 24 June, 1861, and was appointed brigadier general, Confederate States Army, on 26 August, 1861, dated 21 July, 1861. The Newtown Artillery was assigned to the Fourth Brigade, Second Corps, Army of the Shenandoah, under the command of Brigadier General A Elzey, Jr., Confederate States Army, on 25 September, 1861.